Your pace and speed can help you determine how long it will take you to walk or run a certain distance. Comparing these numbers over time can help you track your performance and see if your fitness efforts are paying off. You may also need to know your pace when registering for an event or race such as a 5K, 10K, half marathon or marathon. You can use an online pace and distance calculator or do the math yourself. To calculate your pace, you will need to know the distance you have walked or run and the time it took you to do so. Enter those into the calculator to find your pace. A pace may not be a round number of minutes, in which case you will need to convert fractions of a minute to seconds. You can do this by multiplying the fraction of a minute by 60. For example, 0.5 minutes = 30 seconds. Running 3 miles in 30 minutes = 30 / 3.0 = 10:00 minutes per mile. Walking 3 miles in 45 minutes = 45 / 3.0 = 15:00 minutes per mile. Running 10 kilometers (6.2 miles) in 60 minutes = 60 / 6.2 = 9.68 minutes per mile. But you need to convert the fraction of a minute into seconds. 0.68 minutes x 60 seconds per minute = 41, so the pace is 9:41 minutes per mile. Your speed is the calculation of distance over time, expressed in miles per hour or kilometers per hour. If you have your pace, it is easy to convert it to speed, simply divide 60 by your pace. To calculate your speed, you will need to know the distance you walked or ran and the time it took you to do so. It's also easy to convert pace to speed. When you aren't using whole hours in the calculation, it is best to convert the number to minutes, then multiply the result by 60 minutes per hour to get miles per hour or kilometers per hour. Running a half marathon (13.1 miles) in 90 minutes = 13/1 miles divided by 90 x 60 = 8.73 miles per hour. Running: Speed over 5 mph or pace over 12 minutes per mile. This is vigorous-intensity exercise. Fast walking or jogging: Speed 4 to 5 mph or pace between 12 and 15 minutes per mile. Brisk walking: Speed between 3 and 4 mph or pace between 16 and 20 minutes per mile. This is moderate-intensity exercise. Note that many running races have a time limit equal to a 16 minutes per mile pace. Easy walking: Speed less than 3 mph or pace greater than 20 minutes per mile. This is light-intensity activity. A pace calculator can be a good check on what your GPS fitness app or GPS fitness speedometer is showing you as a speed or pace. These can be inaccurate and you don't want to think you are faster than you actually are. A common factor that contributes to inaccuracy is being in an area with buildings, trees, or hills that block the satellite signal that is used to measure your position. It's a good idea to check any device against measuring your walking or running speed over a know distance using a timer. If you know your pace and how much time you will be walking or running, you can calculate how far you should go in that time. This can be useful if you have a set amount of time for a workout and want to see how far you could go in that time. Sometimes you will need to convert distances, in which case it is useful to know that a kilometer is 0.62 miles and a mile is 1.61 kilometers. Knowing how long it will it take you to finish is a critical piece of knowledge to have before you register for a race. Walkers and slow runner must be they can finish in under the course time cutoff. You may also want to compare your finish time with lists of winners to see if you might qualify for a trophy for your age group. To calculate your finish time, you will need to know your pace in minutes per mile or minutes per kilometer, and the distance of the course. Enter those into the calculator. Be sure you are checking your pace in more than one way, as a GPS-based speed may be inaccurate. Doing a timed mile or a timed kilometer can be a better way to find an accurate pace. Otherwise, your finish time will also be inaccurate. 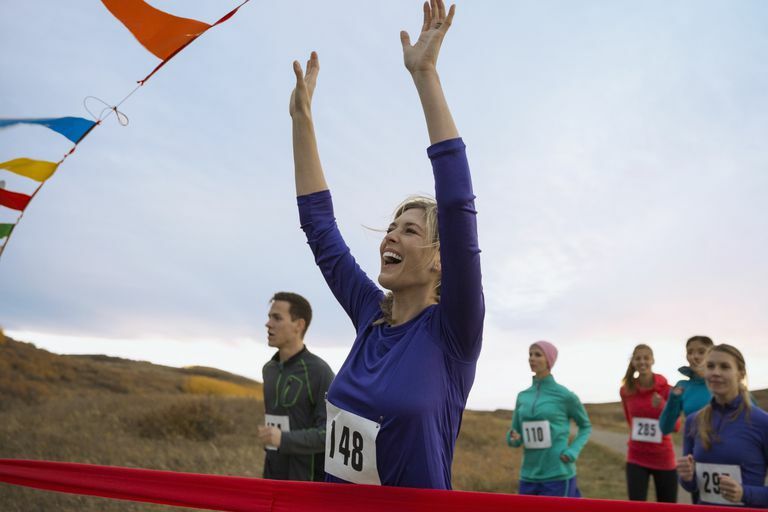 While you may be able to time yourself over a mile or kilometer and use that to predict your time for a 5K or 10K race, you probably won't be able to maintain the same speed over a half marathon or marathon. Ways to predict your finish time vary. One method suggested by Dr. John Robinson is to add 20 seconds to your mile each time you double your distance. For example, if you've finished a half marathon, find your average minutes per mile and add 20 seconds to that. To find your finish time for a marathon, you would then multiply your minutes per mile pace by 26.2 miles. Marathon coach Hal Higdon suggests multiplying your 10 kilometer finish time by 5 to find your marathon finish time. Do You Need to Speed Up? If you aren't happy with the results of the pace calculator, use these tips and lessons to speed up. You can learn how to walk faster using better posture, arm motion, and rolling through each step from heel to toe with a strong push-off. The Olympic-style racewalking technique is best learned from a coach in person, but if you put the time into learning it you could soon outpace many runners at local events. Many people use a walk/run technique for longer races, alternating walking and running intervals. This can get you to the finish line faster and improve your fitness. If you are a runner, you can learn to run faster: by working on your turnover, tempo runs weekly, and interval running workouts, and hill training. Measuring Physical Activity Intensity. Centers for Disease Control and Prevention. https://www.cdc.gov/physicalactivity/basics/measuring/index.html. Should New Runners Try to Improve Their Distance or Speed? What Is the Difference Between Speed, Power, and Race Walking?